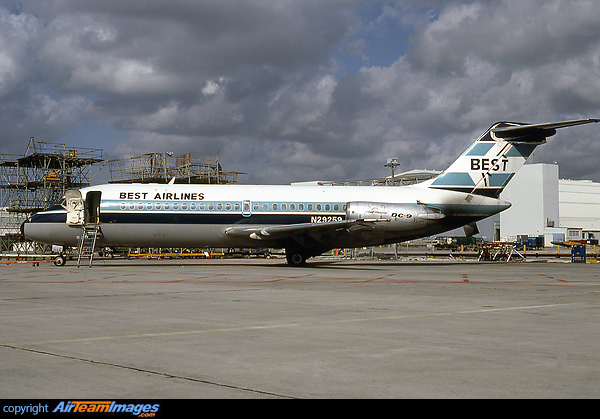 Best Airlines was a small airline that flew to cities in the Mid-Atlantic United States in the mid-1980s. This DC-9-14 was lease from British Midland Airways and was ex G-BMAC. The McDonnell Douglas DC-9 is a single-aisle short to medium jet airliner. It was a two engined partner for the DC-8 programme, and a smaller rival for the Boeing 727. It is known for its long life and reliability, many of the youngest are still active. The DC-9-14 was an early, short version of the type, the -14 was a slight upgrade on the initial production version, the series 10.